Lovely map of the Republic of the United Provinces. Les Pays Bas Francois, Autrichiens, et Hollandois. 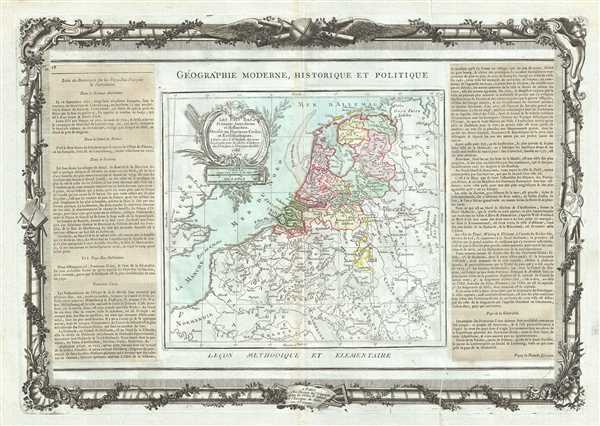 This is beautiful map of Holland (The Netherlands) and Luxemburg by the French Cartographer Louis Brion de la Tour. It extends from the North Sea south to include Luxembourg. Covers Netherlands and Luxemburg. The 'Republic of the United Provinces' was officially recognized in the Peace of Westphalia (1648), and lasted until 1795, when Napoleonic forces invaded and set up a new French client state, the Batavian Republic. After Napoleon's fall in 1815, the Congress of Vienna united these provinces with the Low Countries to the south to form the United Kingdom of the Netherlands. The Netherlands, with the world's first stock exchange, is considered to be the birthplace of the modern capitalist economy. A beautifully engraved title cartouche adorns the top left quadrant of the map. To the left and right of the map are paste downs of French text with remarks and description of the map. Surrounding the whole is an elaborate decorative border featuring floral arrangements, surveying tools, elaborate baroque scalloping, and a winged globe. This map was issued as plate no. 27 and 28 in the most deluxe edition of Desnos’ 1786 Atlas General Methodique et Elementaire, Pour l’Etude de la Geographie et de l’Histoire Moderne.